In a backhanded tribute, the train is perceived as such an effective tool of political cohesion that the Basque militant group ETA has effectively declared war on a project that would link the Basque region to Madrid. The 2.5-hour route between Madrid and Seville handles about 89 percent of railway and air traffic between the cities, according to Renfe, the state railway operator. In its first year, the Madrid-Barcelona route lured nearly half the five million passengers who would normally fly between the cities, Renfe said. Supporters say such statistics bolster the train’s green credentials: The International Union of Railways says a high-speed train can carry eight times as many passengers as an airplane over a given distance, using the same amount of energy and emitting a quarter of the carbon dioxide for each passenger. This is about what you'd expect, and explains why, for instance, back in the 1990s, Southwest Airlines did everything it could to scuttle the creation of a Texas high-speed rail system that would've connected Houston, Dallas-Forth Worth, and San Antonio. After an onslaught of restraining orders, lawsuits, motions, and injunctions from Southwest, the proposal quietly died. Anyway, people are always curious about cost, and that's a major issue with Spain's high-speed rail. 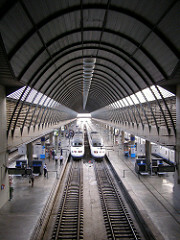 By 2020, the country will have spent some 100 billion euros on infrastructure and trains. The rail system will likely never break even without government support. But on the plus side of the ledger, the rail network reduces congestion, cuts greenhouse-gas emissions, and boosts economic and social mobility. Burnett profiles Lleida, a small Spanish town of 125,000 that now sits just an hour's train ride away from Barcelona (it used to be a five-and-a-half hour trip). The town has seen a massive boom in tourism, just set up a new high-tech industrial park in 2005, and is now scrambling to build a shiny multimillion-dollar convention center and develop the area around the station. It'd be curious to tally up all those costs and benefits. Another example from the Wall Street Journal: Ciudad Real, a town 120 miles south of Madrid that had practically become a ghost town until it got a high-speed rail station putting it 50 minutes away from capital. Commuters started moving to the town, industry flocked in, and the city has "come alive," with the trains in both directions packed full. Here in the United States, what might the prospects for, say, Detroit look like if it was only 60 to 90 minutes away from Chicago or Cleveland by bullet train?